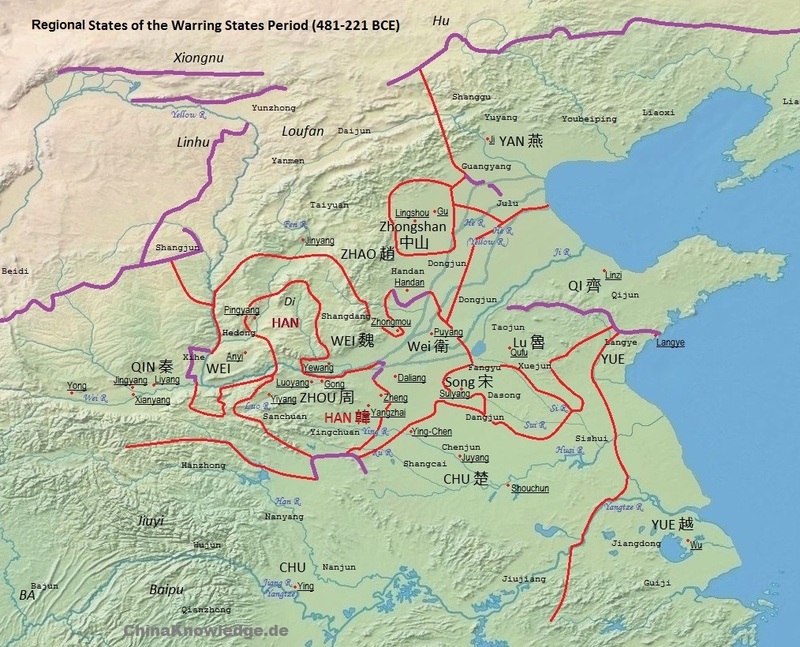 Don't confound this regional state of the Zhou period with the Han dynasty 漢 (206 BCE-220 CE) or the kingdom of Han 韓 that was ruled by Xin, King of Han 韓王信 (r. 205-202 BCE). Han 韓 was a regional state of the Zhou period 周 (11th cent.-221 BCE). It emerged as an independent polity when three noble houses in the state of Jin 晉 extinguished the ducal house and divided its territory into three parts, namely Wei 魏, Han and Zhao 趙. Han played an important role during the Warring States period 戰國 (5th cent.-221 BCE) as one of the large regional states fighting against the state of Qin 秦.
Map according to Tan Qixiang 谭其骧 (1987), Zhongguo lishi ditu ji 中国历史地图集. Han was located in the centre of Zhou period China and thus exposed to pressure from all sides. It was the first of the greater regional states which fell victim to the expanding kingdom of Qin. Click to enlarge. Han was located in the southern parts of the modern province of Shanxi and later expanded towards the centre of modern Henan. The chronicles of Han have not survived in a good state, so that many data and informations are unclear. The house of Han was ruled by descendants of King Wu 周武王, founder of the Zhou dynasty. It was related to the houses of Han (2) 邗, Jin and Ying 應, of which only Jin was of greater importance. The lords of Han, the earliest known of which is Viscount Wu of Han 韓武子, were direct subjects to the house of Jin, and had been made grand masters (dafu 大夫) over the lands in the Plain of Han 韓原 (near modern Hancheng 韓城, Shaanxi). Other texts say that lord Han Wan 韓萬 was a son of "Uncle" Huan of Quwo 曲沃桓叔, which means that Han was a lateral branch of Jin, and not a direct descendant of King Wu. It might be that one lord of Han was also posthumously called "Uncle Huan", which leads to confusion. The lords of Han had actually the right to bear the royal family name Ji 姬, but lord Han Jue 韓厥 (Han Xianzi 韓獻子) was granted the family name Han. Under Duke Jing of Jin 晉景公 (r. 600-581), the Minister of Justice (sikou 司寇) Tu'an Gu 屠岸賈 desired extinguishing the house of Zhao Dun 趙盾 (Zhao Xuanzi 趙宣子), who had rebelled against the Jin dynasty. Yet Han Jue helped some members of the house of Zhao to survive the annihilation. Sources: Chen Houyao 陳厚耀, Chunqiu Shizu pu 春秋世族譜 (Lianghu Shuyuan edition 兩湖書院正學堂本). Wang Wenyuan 王文源, Chunqiu shizu jilüe 春秋世族輯略. In 589, Han Jue and Xi Ke 郤克 conducted a successful military campaign against the state of Qi 齊 in the east. For this victory, Duke Jing created the offices of the six ministers commander (liu qing 六卿), one of which was to be filled by Han Jue. He is posthumously granted the title Viscount Xian of Han 韓獻子. He was succeeded by his son Qi 起 (courtesy name Xi 徙), who is known as Viscount Xuan of Han 韓宣子. He moved his seat of government to Juzhou 居州 (near modern Wenxian 溫縣, Henan), and his successor Viscount Zhen 韓貞子 moved to Pingyang 平陽 (monden Linfen 臨汾, Shanxi). During the reign of Duke Ping of Jin 晉平公 (r. 558-532), an embassador of the state of Wu 吳 arrived, called Ji Zha 季札, who predicted that the house of Jin would be divided among Han, Wei and Zhao. In 514, Han, Zhao and Wei occupied the territory of the lords of Qi 祁 and Yangshe 羊舌. In 497, Han and Zhao attacked the lords of Fan 范 and Zhonghang 中行 that were also counted among the six ministers commander. A few generations later, Viscount Kang of Han 韓康子, Viscount Xiang of Zhao 趙襄子 and Viscount Huan of Wei 魏桓子 destroyed the house of Zhi 知 (also written 智). Viscount Kang's son Qizhang 啟章, known as Viscount Wu 韓武子 (r. 424-409), even dared to attack the state of Zheng 鄭, where he killed Duke You 鄭幽公 (r. 424-423). Viscount Wu moved his seat to Yiyang 宜陽 (modern Yiyang, Henan). His son Chu 處 (courtesy name Qian 虔), again attacked Zheng, yet Zheng also fought back and besieged the town of Yangdi 陽翟. In 403, Chu/Qian was granted by the king of Zhou the title of marquis (hou 侯), and is therefore posthumously known as Marquis Jing 韓景侯 (r. 409-400). Marquis Jing resided in Yangzhai 陽翟 (modern Yuxian 禹縣, Henan). During the reign of his son, Marquis Lie 韓列侯 (r. 400-387), Nie Zheng 聶政 killed the counsellor of Han, Xia Lei 俠累 (also called Han Kui 韓傀). Marquis Lie was succeeded by Marquis Wen 韓文侯 (r. 387-377). Interestingly enough, the Zhushu jinian 竹書紀年 "Bamboo Annals" do not list Marquis Wen, while the Shiben 世本 genealogies know nothing of Marquis Lie and instead call him Marquis Wu 韓武侯. The military campaigns of Han during these years continued targeting the state of Zheng, but Song 宋 was likewise attacked, and in 380, the armies of Han even several times invaded Qi. Marquis Ai 韓哀侯 (r. 377-371) participated in the partition of Jin among Han, Zhao and Wei. In his second year of reign, Marquis Ai finally destroyed the state of Zheng and moved his capital seat to the town of Zheng (modern Xinzheng 新鄭, Henan). For this reason the book Zhanguoce 戰國策 calls the later King Xuanhui of Han 韓宣惠王 (shortly called King Hui 韓惠王) also King Hui of Zheng 鄭惠王, similar to the king of Wei, who had his capital seat transferred to Daliang 大梁 and was therefore called King Hui of Liang 梁惠王 (r. 371-335). Marquis Ai was killed by Han Yan 韓嚴, who is also called Han Zhongzi 韓仲子 or Han Sui 韓遂. He enthroned Marquis Yi 韓懿侯 (r. 371-359), who is also called Marquis Zhuang 韓莊侯. During the latter's reign, Han was several times defeated by the armies of Wei. His son and successor Marquis Zhao 韓昭侯 (r. 359-333) saw the states of Qin and Song also occupy border towns of Han. Han was surrounded by the states of Wei, Chu, Zhao and Qin, all of them militarily strong. In 353, Marquis Zhao attacked the small territory of the Lord of East Zhou 東周 in Gong 鞏. With the help of the legalist counsellor Shen Buhai 申不害, state and army of Han were reformed, and Han won back strength again. Shen Buhai's political concept was the "art of rulership" (shu 術). Fragments of his thinking are to be found in the book Shenzi 申子. The chronicles of Han say that in 349, Grand Master (dafu) Han Ji 韓姬 (also written 韓玘) killed Duke Dao 悼公, but do not explain who Duke Dao was. It might be that Duke Dao was the posthumous title of a prince of Han who did not come to rule. The "Bamboo Annals" also speak of a Marquis Wei 韓威侯 (King Wei 韓威王) as successor of Marquis Zhuang. The identity of Marquis Wei cannot be ascertained. The successor of Marquis Zhuang adopted in 323 the title of king. He is posthumously known as King Xuanhui 韓宣惠王 (r. 333-312). In 325, the army of Wei defeated general Han Ju 韓舉 (Han Buyi 韓不疑). Qin seized the towns of Yan 鄢 and Xiuyu 脩魚 and captured the generals Han Mo 韓貘 (or Han Geng 韓鯁) and Shen Cha 申差. Counsellor Duke Zhong 公仲 suggested to King Xuanhui to buy peace from Qin by bribing its counsellor Zhang Yi 張儀, and offering to participate in the military campaign against the state of Chu 楚 in the south. Yet the king of Chu was advised by Chen Zhen 陳軫 to feign offering help to Han against Qin. King Xuanhui was won over and broke his alliance with Qin. Enraged, the king of Qin attacked Han, but Chu was unable to send support. In the end, Crown Prince Cang 倉 was sent to Qin as a hostage ensuring peace. The war alliance finally came into being, and Chu was attacked and defeated at Danyang 丹陽. Prince Cang succeeded to the throne. He is known as King Xiang 韓襄王 (r. 312-296). In the early years of King Xiang's reign, Qin conquered the town of Yiyang 宜陽 which opened the way to the Yellow River plain. After the battle, the general of Qin massacred 60,000 captives of Han. Qin also conquered the towns of Yan 鄢, Shizhang 石章, Wusui 武遂 and Rang 穰. In 300, Han again became an ally of Qin and participated in a campaign against Chu. In the same year, the Crown Prince Ying 嬰 died. Prince Jiu 咎 and Prince Jishi 蟣蝨 (Jise 幾瑟) contended for power, yet the latter dwelled in Chu as a hostage. Su Dai 蘇代 developed a politically very complex plan to prevent Prince Jishi's return to Han, so that Prince Jiu became Heir Apparent and then ruler. He is known as King Xi of Han 韓釐王 (r. 296-273). In the year of his accession to the throne, the states Han, Wei, and Qi joined their armies for an attack on Qin and advanced into the Hangu Pass 函谷關, forcing Qin to render back formerly occupied territory. In 293, Prince Xi 喜 commanded the armies of Zhao and Wei that attacked Qin, yet the allies were defeated in the battle of Yique 伊闕 and Qin occupied the town of Wan 宛. In 284, King Xi again supported Qin in its war against the state of Qi. General Bao Yuan 暴鳶, helping the state of Wei, was in 275 defeated by Qin, and Zhao lost the towns of Shaoqu 少曲, Gaoping 高平 and Nanyang 南陽. In 273, Wei and Zhao attacked Han and occupied Huayang 華陽. The king of Qin first refused to help, but Chen Shi 陳筮 (Chen Quan 陳筌, Tian Shu 田荼) travelled to Qin, visited the powerful Marquis Rang 穰侯 and pursued him to send relief troops that defeated Zhao and Wei. During the rule of King Huanhui of Han 韓桓惠王 (r. 273-239), Qin conquered the town of Jingcheng 陘城, attacked the region of Mount Taihang 太行, and Zhao conquered the commandery of Shangdang 上黨. In 261, Qin conquered Goushi 緱氏 and Lun 綸. In the battle of Changping 長平 a year later, Qin destroyed the army of Zhao. The powerful state continued conquering the towns of Yangcheng 陽城, Fushu 負黍, Chenggao 城皋 and Xingyang 滎陽. The last ruler of Han was Prince An 安 (r. 239-230). During his reign, Prince Fei 非 (better known as Han Fei 韓非) was sent to Qin to negotiate peace (offering Qin to support it in the conquest of Zhao), yet Han Fei stayed in Qin and became for a short while an important legalist advisor of the king of Qin. He was then forced to commit suicide. In 230, King An was captured by an army commanded by metropolitan chamberlain (neishi 内史) Teng 騰. His country was transformed into the commandery Yinzhou 潁州. The name of Han was never again used as name for a dynasty, only for princedoms. 230 Han conquered by Qin 秦.
Shiji 史記, 45, Han shijia 韓世家. Li Ling 李零 (1992). "Han 韓", in Zhongguo da baike quanshu 中國大百科全書, Zhongguo lishi 中國歷史 (Beijing/Shanghai: Zhongguo da baike quanshu chubanshe), Vol. 1, 295.